In parts 1 and 2 of our LinkedIn partner blog series — “The New Face of Today’s Hourly Worker” — we dug into who hourly workers are and what they want and how to attract applicants and avoid drop-off. In Part 3, we’ll look at how you can drive engagement and retention by hiring for key future manager job skills. While the common perception is hourly workers just see their jobs as a way to pay the bills or get through school, almost half say they plan to stay 3+ years and see their hourly job as a long-term career investment. Here are 10 job skills that can help you identify hourly candidates with strong management potential and good long-term investment outlooks. While each business requires some level of specialization for employees to advance to management positions, there are some common job skills Snagajob + LinkedIn’s research found that are universal indicators of success. Include these skills in your hourly job descriptions to hire candidates who are on the right track for management. Additionally, take a look at your employee training and development programs and focus courses around building these solid core managerial skills. There are also some industry-specific job skills that set hourly workers up for management success. Below are the most common job skills restaurant and retail store workers need to move into manager roles. The sample questions serve as a quick managerial competency check and give you a sense of what a manager should know how to answer. Though many hourly workers may be hired as a cashier, sales associate or cook, those who want to move up to management positions look for opportunities to learn bigger-picture business skills. The job skills that are most likely to get hourly workers promoted center around core business operations — like Finance, Profit and Inventory — and employee management. Alternatively, candidates who are unwilling to move beyond a basic job function or have none of the above job skills signal bad fit and high churn risk. If you want to attract and retain great workers, one of the best ways is by providing them with job development and advancement opportunities. Using the lists above as a starting point, create an ideal manager “persona” unique to your company, detailing the job skills and requirements you want every manager to have. By setting clear, company-wide expectations for employees around the job skills and experience they need in order to be considered for management positions, you give employees a clearer career path … and a big reason to stay. It also gives you a huge perk that can help you attract more high-quality candidates. 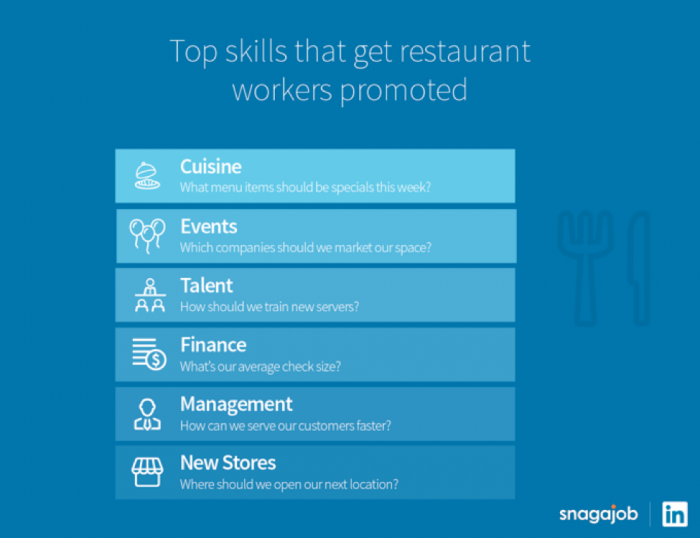 Snagajob and LinkedIn partnered for the industry’s most in-depth analysis on hourly workers. Data analyzed included Snagajob job application activity to its top 142 employers over the past three years. This was comprised of 120+ million applications by 20+ million hourly workers. Analysis on age and education included the total Snagajob database. (Note: Education results exclude the 2% of applicants with unknown education.) 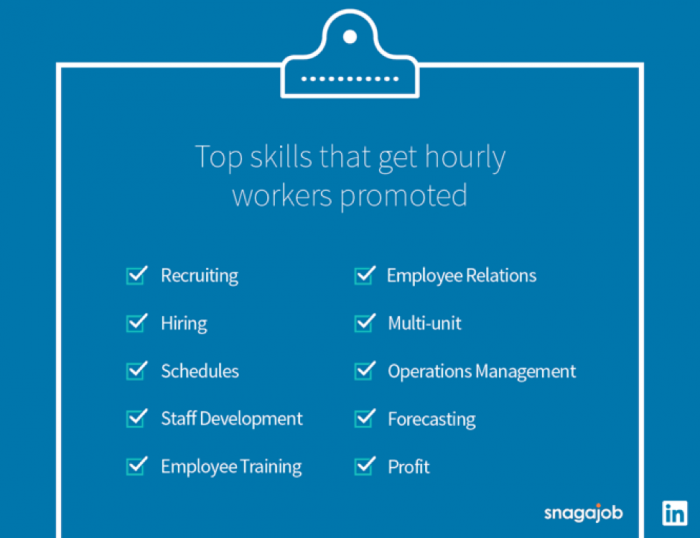 Snagajob and LinkedIn researchers then examined millions of LinkedIn profiles with common hourly job titles to learn more about hourly workers. Results represent the hourly world seen through the lens of Snagajob and LinkedIn data. As such, it is influenced by how LinkedIn members choose to use the sites, which can vary based on professional, social, and regional culture, as well as overall site availability and accessibility. These variances were not accounted for in the analysis.